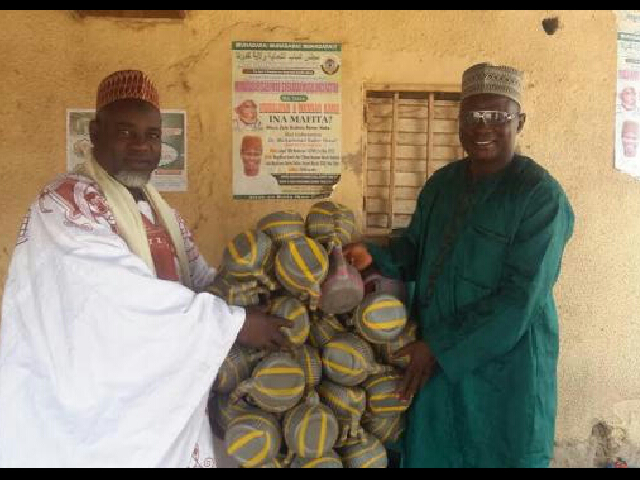 In a bid to promote religious tolerance and better understanding among different faith organizations in Nigeria, a team of Christian clerics have donated over one hundred plastic kettles and prayer Mats to some mosques in kaduna metropolis. The team was headed by General Overseer of Christ Evangelical Intercessory Fellowship Ministry Sabon Tasha Kaduna, Pastor Yohanna Buru, accompanied by some Reverend fathers, Evangelists and Church Members. Pastor Buru said, “we have come to donate these Plastic Kettles and Prayer Mats to the mosques leaders because we all worship one God and we are one family of Adams and Eve. Both the churches and mosques are all holy places of God. Pastor Buru further said that, “last year, I was invited to over 60 Maulud celebration (Birth of the Holy prophet mohammad S.A.W) and this year also I attended over 10 different Maulud celebration by different Muslim organizations in kaduna and some other neighboring states and I did that because the bible teaches us to joy and celebrate with our neighbors and also to mourn with them when something bad really happen to them. ”Muslims are our brothers and neighbors ,we must join hands together to live in peace, because we all have Holy Books “Qur’an and Bible” and both faith believed in the teachings of these books. We must support Muslims when building mosques as some of them also support us when constructing our churches,” he added.